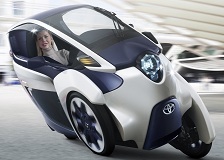 Toyota decided they were going to bring something different to the Geneva Motor Show. Here we have a small two seater small city car that will take the fight to the Renault Twizy starting with the Geneva Motor Show. Meanwhile Apple will sue Toyota because of the chosen name.